Sahara came up with a proposal to pay Rs 2,500 crore within three days, and the remaining amount in five instalments. Sahara’s bid to get its chief Subrata Roy released from jail fell flat on Friday after the Supreme Court rejected its plea, lashing out at the group for “insulting” the court while not being willing to pay back investors’ money. 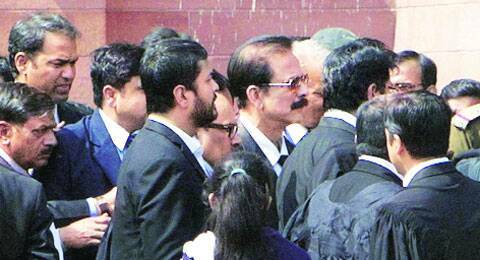 A bench of Justices K S Radhakrishnan and J S Khehar described Sahara’s proposal on refunding investors as “dishonourable”, and refused to order Roy’s release. It posted the matter for Tuesday — and Roy will remain in judicial custody until then. He was sent to the jail on March 4. Sahara came up with a proposal to pay Rs 2,500 crore within three days, and the remaining amount in five instalments, the last of which was to come in July 2015. Senior advocate C A Sundaram pleaded with the court to release Roy, claiming it would be impossible to borrow money without him. “One person who can find money is not in a position to do so. Let him come out and he will look for money. Let this Rs 2,500 crore that we are paying up front help him come out,” the lawyer said. The bench shot down the plea as “not acceptable”, especially in view of the fact that Roy had been jailed only two days ago, and had been free to arrange the money over the last year and a half when the court was asking him to. “We will tell you how this looks to us. You make us sit in a special bench and then you give a proposal which is not acceptable at all. It is a big insult for us to make us assemble in a special bench when you don’t have a proper offer to make. You cannot make judges of the Supreme Court assemble for a man who is not willing to pay,” the court said. While addressing a grievance put forth by Roy’s lawyers that they were not being allowed to meet him, the court said the counsel and financial consultants will be permitted to meet him in Tihar jail between 10 am and 12 pm to help the group finalise a proposal for redemption. Meanwhile, senior advocate Rajeev Dhawan requested the court to remit Roy to police custody from judicial custody in Tihar, arguing that he was not charged with any criminal offences. The bench said it will consider this plea on Tuesday as well. Earlier, SEBI’s counsel Pratap Venugopal strongly opposed the offer made by Sahara on the ground that the group was bound to pay Rs 34,000 crore, along with interest, but the proposal was being made only for Rs,17,400 crore. He also objected to granting Sahara 17 months to deposit the money.